Varicose Veins: do you believe they are important? Have you ever wondered why an older woman in your family such as your grandma, an older aunt or even your mom has different colored veins? They probably have varicose veins. Varicose veins are swollen veins that are usually the colors red or blue. Varicose veins are the result of when a vein is effected by a disease and the valve cuffs do not work anymore according to (1). Varicose veins cause pressure in the veins and the walls of the veins are weakened by long periods of standing. I have had many relatives with Varicose veins and I never knew it was an actual thing. I presumed it was natural. I wonder if there is medical treatment for it. I have found that treatment is case by case but with the common being Sclerotherapy which is a solution that is injected into the veins to make sure the veins do not carry any more blood. Other forms of effective treatment are ablation, compression stockings, elevating the feet, and laser treatment. Varicose veins can get risky for the body and surgery is suggested at that point. What makes it very alarming is that “Three fourths of the population of the United States age 65 or older have varicose veins.” (2) There are preventive steps according to a source to developing varicose veins which includes not wearing tight clothing, being a healthy weight, and elevating your feet. It also says that crossing your legs while sitting should not be done to prevent varicose veins. While these are helpful steps someone may still end up getting varicose veins. Another source states that “Varicose veins are widely seen as medically unimportant and deserving low priority for treatment” (3) I believe they are important as even though according to most sources such as the ones I have mention state that the varicose veins becoming dangerous are not very common. I believe that it is important because it could in the future evolve and become more dangerous more often. There are not many studies that have been done on varicose veins of my findings. One source goes in detail as to what more can happen when having varicose veins. Varicose veins can cause blood clots, skin changes, and ulcers. It is also very frightening that at some points varicose veins can be confused with other medical things that are also harmful. 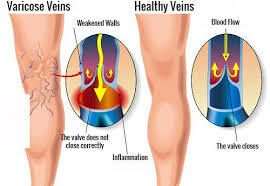 It is a relief to know that varicose veins normally do not run the risk of having vein thrombosis. “Varicose Veins.” Varicose Veins | Johns Hopkins Medicine Health Library. N.p., n.d. Web. 26 Nov. 2016. Soderman Thomas, William A. “Varicose Veins.” Varicose Veins – Science Direct Topics. N.p., 2005. Web. 26 Nov. 2016. “Varicose Veins and Their Management.” N.p., 05 Aug. 2006. Web. 26 Nov. 2016. This entry was posted in Uncategorized on December 1, 2016 by lkr5215. This is very interesting! It would’ve been good to see a bit more research though. Maybe you could’ve found some studies that actually tested the ideas for treatments mentioned! My mom actually has a lot of varicose veins, and she hates them. She hates to wear shorts because she doesn’t like the veins showing. The only thing is she isn’t overweight, she doesn’t wear tight clothes, she doesn’t do anything this mentioned may be reasons for the veins! I wonder what caused them for her.